Sue has found a plant new to the Island, and to the UK, growing on the south facing bank of Ryde Canoe Lake. 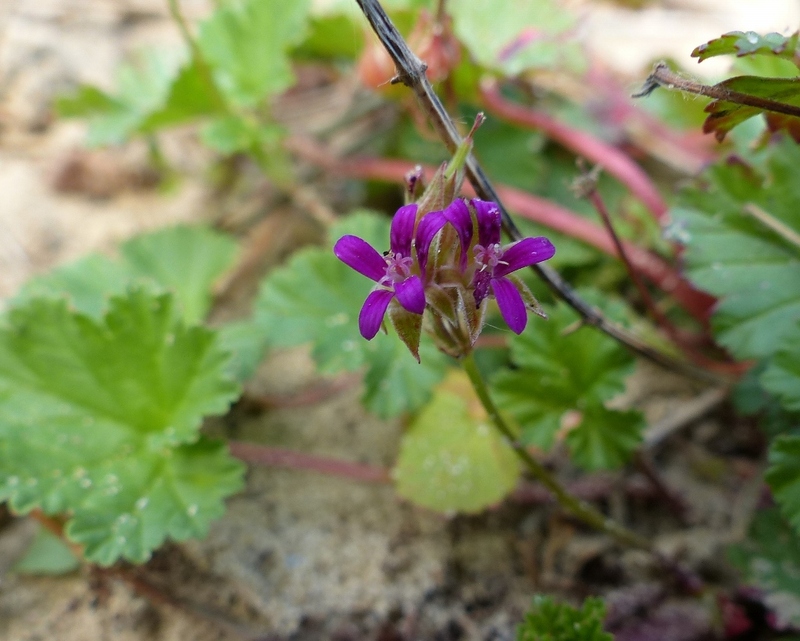 She discovered a group of at least 10 low-growing plants with striking small magenta flowers and at first thought they were a type of cranesbill. She contacted Colin Pope, the Botany Recorder, who visited the site and realised that they did not fit the description of any plant in standard British Floras such as Stace (2010). Expert botanist, Eric Clement, came across from Gosport. By this time, we had concluded that the plant was a type of Pelargonium, however it was a weedy species and completely unlike any Pelargonium in cultivation in this country. Currently, Eric thinks the plant can be assigned to Pelargonium inodorum, one the few species native to Australia and New Zealand (most Pelargonium come from South Africa) where it is a short lived pioneer species of disturbed land. It is a good fit for the description in Diane Miller Pelargoniums – a gardeners guide to the species and their hybrids and cultivars (1996) but internet searches show this species with pale pink flowers. It is a mystery how this plant arrived at Ryde Canoe Lake. It is not close to any cultivated flowerbeds and indeed does not seem to be grown in cultivation in this country. However, it has clearly been well established here for several years and shows signs of spreading. Despite being a well botanised spot, this plant has been overlooked by botanists until Sue came across it recently.